Here at the Sybaritic Singer, I am always keeping an eye out for the interesting and innovative ways we engage with opera in our everyday lives. So, I was particularly impressed when I stumbled into a project by my friends and colleagues, Rhymes With Opera, on Kickstarter the other day. This June, Rhymes With Opera will team up with the West End String Quartet and composers David Smooke and George Lam to present Criminal Intent: a crime opera double bill. Rhymes With Opera is looking for funding for this felony themed endeavor and using Kickstarter to raise awareness. I want to help spread the word by giving you a three-part introduction to the creatives behind the project. Ruby Fulton, composer, co-artistic director of Rhymes With Opera, and fellow Iowan (couldn’t help myself) is going to get the party started. As a co-artistic director of Rhymes With Opera, can you tell me more about your mission to bring new opera and music-theater into unexpected spaces? With Rhymes With Opera, we are exploring how the venue affects the way opera works. The first big question to ask is what is opera? And it’s a much harder question to answer than you’d think! The only thing I know for sure is that opera involves a lot of collaboration. You can think of it historically back to the days of opera superheroes like Verdi, putting on shows with huge teams of artists, musicians, writers, costume designers, dancers, and so on. When RWO takes our operas out of the black box and into places like Metro Gallery (in Baltimore, where we’re playing in January), we’re opening up the possibilities for possible collaborators – musicians, artists and creative people who are more at home in a bar than in a hall. In the future, I want to collaborate with mimes, actors, painters, dancers, little kids, noise bands, folk singers, everyone! Each of these groups of people has different spaces where they “make sense.” There’s also a different audience in every space and it’s interesting to see how that works, too. We’re really lucky to have a company of three opera singers who are incredibly diverse. Bonnie Lander, RWO soprano, plays fiddle in a rock band in Philadelphia and performs experimental improvisation with her voice. Robert Maril, RWO baritone, DJs at a club in New York once a week. And Elisabeth Halliday, RWO soprano, is a great actor and very active in working with young composers. 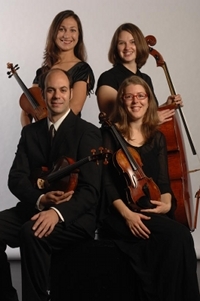 How did your collaboration with West End String Quartet come about? RWO collaborates with a different ensemble each season. Last year, we played with the Baltimore experimental hip hop quartet, Soul Cannon. And the year before that, we worked with the AM/PM Sax Quartet. The idea is that we commission composers to write an opera for our core ensemble (3 opera singers) plus a collaborating ensemble as the sort of pit orchestra. Then, the collaborating ensemble also plays a set at the show. George and I go way back with one of the violinists in the West End String Quartet, Sarah Washburn. We met when we were freshmen geeks in the music department at Boston University. Somebody just told me that your best friends are the ones who knew you when you were broke. George and Sarah are two of my very best friends and it’s going to be a lot of fun putting on these shows together. You have quite the East Coast tour planned. How did you choose the venues? We’re still working on booking all the shows for the June east coast tour, but we do have Baltimore booked, at the Windup Space on June 18. That’s one of my favorite spaces in Baltimore and I’ve always wanted to play there with RWO, so I’m really looking forward to it. I think the string quartet will sound great there, too. Tell me more about your decision to campaign on Kickstarter. I read recently that Kickstarter is the largest funding platform for artists in the world, so I figured RWO ought to try it out. I think the award system is pretty neat. By donating to support a creative project, you can get custom-made rewards for that particular project. It’s cool because not only is it an incentive to give, it’s also a way for the artist to reach out and share their work with interested parties. Thank you for giving us a glimpse into your project, Ruby! Sybaritic Faithful, head on over to the Rhymes With Opera: Criminal Intent page at Kickstarter to see all the great incentives they have for being a backer. Starting with a $10 pledge you get 2 free tickets to RWO show of choice in the 2010/2011 season. Kickstarter is a great way to foster grass-roots support of opera in all of our communities. I’m glad to see that RWO is already 44% funded. But, they only have 13 days left in the campaign to reach their goal. This is your chance to be a financial backer in the field you are passionate about. Stay tuned for our next interview with composer and co-artistic director of Rhymes With Opera, George Lam.